Register for the Lanier Under the Lights 5K today! Races start at 5:45 PM each day! Additional race information can be found at http://lanierunderthelights5k.com/. SATURDAY'S RACE HAS FILLED & CLOSED TO ADDITIONAL REGISTRATIONS (at 10.12 at 10:00am), but Sunday's race remains open to new registrations! To reserve a race tee, participants must register before November 1st at 11:59pm. From Nov 2nd - Nov 7th the price will go down to $30.00, however the lesser price DOES NOT include a race tee. All registered participants will receive a finishers medal upon completion of the race. Sunday's race will close at 2,050 participants, and likely before Nov 7th. Margaritaville at Lanier Islands is doing some great stuff for this year's race, and LOTS of new light displays will be added to outdoor winter park adventure and the race course as well! As always our 5K winds through 3.1 miles of towering Christmas light displays as part of Lanier Islands ‘Magical Nights of Lights' before vehicle tours start on Nov 19th. Each night we start the 5K Run/Walk at 5:45pm which is right at dusk. Runners and walkers alike will enjoy seeing the light displays, Christmas music playing on the course, and don't forget the Santa Claus bobble head dolls for our overall and age group awards. Support the Marine Corps Toys for Tots by bringing a toy or check valued at $10.00 or more for entry into our Marine Corps Toys for Tots RAFFLE held at each race. New for 2018, each registered participant will receive a finishers medal! Check out the medal shown at the bottom of this page. Finishers Medal, New for 2018! 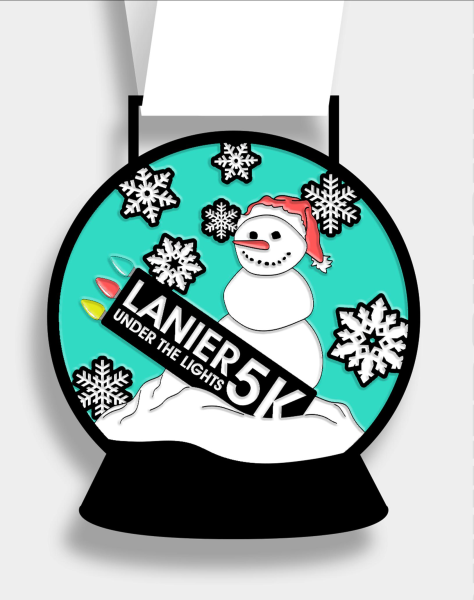 Each registered participant will receive a 2018 Lanier Under the Lights finishers medal.